The manatee may be one of the more iconic animals in the state of Florida. In Wyoming, we think of bison and bears. In Florida, we think of alligators and manatees. However, encountering this marine mammal in the Florida panhandle is a relatively rare occurrence… until recently. 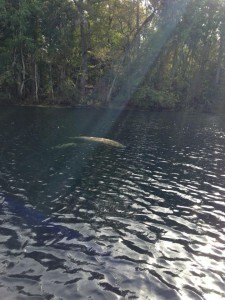 For several years now, visitors to Wakulla Springs – in the eastern panhandle – have had the pleasure of viewing manatees on a regular basis. It is believed about 40 individuals frequent the river. Last year there were eight individuals that frequent the Perdido Key area, and a couple more were seen more than once near Gulf Breeze. This is not normal for us, but already this year one manatee has been spotted in the Big Lagoon area – so we may be seeing more as the summer goes on. So what exactly is a manatee? It is listed as a marine mammal, but frequents both fresh and saltwater habitats. Being mammals, they are warm blooded (endothermic). Maintaining your body temperature internally allows you to live in a variety of cold temperature habitats but water can really draw the heat quickly from anyone’s body. Marine mammals counter this problem by having a thick layer of fat within the skin – insulation called blubber. However, the manatees blubber layer is not very thick. So they are restricted to the tropical parts of the world and, in Florida, spend the winter near warm water springs. Many have learned the trick of hanging out near warm water discharges near power plants. In the warmer months, they venture out to find lush seagrass meadows in which to graze. They are herbivores. Possessing flat-ridged molars for grinding plant material, they are more closely related to deer and cattle than the seal and walrus they look like. They lack canines and incisors, which deer and cattle use to cut the grass blades, but have large extending lips that grab and tear grasses with – very similar to the trunk of an elephant, which is their closest relative. Like many mammalian herbivores, they grow to a large size. Manatees can reach 15 feet in length and over 1000 pounds. They have two forearms that are paddle shaped and used for steering. The tail is a large circular disk called a fluke, which propels them through the water and is often seen breaking the surface. They are generally slow moving animals but can startle you when they decide to kick into “fourth gear” and burst across the river. They are generally solitary animals, gathering in the wintertime around the warm springs. Males usually leave the females after breeding and do not form family units, or herds. Females are pregnant for 13 months and typically give birth to one calf, which stays with mom for two years. Like all mammals, the young feed on milk from mammary glands, but these glands are close to the armpits on the manatee. This makes it much easier for the calf to feed while both are swimming. This is not the case with dolphins and whales, where the mother must roll sideways to feed her young. Manatees hanging out in Wakulla Springs. There are three species of manatees in the world today. The Amazonian Manatee (Trichechus inunguis), the West African Manatee (Trichechus senegalensis) and the West Indie Manatee (Trichechus manatus). The Florida Manatee is a subspecies of the West Indian (Trichechus manatus latirostris). In the 1970’s it was estimated there were about 1000 West Indian manatees left in the word. Today, with the help of numerous nonprofits and state agencies, there is an estimated 6600 in Florida. Due to this increase, the manatee has moved from the federal endangered species list to threatened species. That said, human caused mortality still occurs and boaters should be aware of their presence. Since 2012, an average of 500 manatees die in Florida waters. Most of these are prenatal or undetermined, but about 20% are from boat strikes. 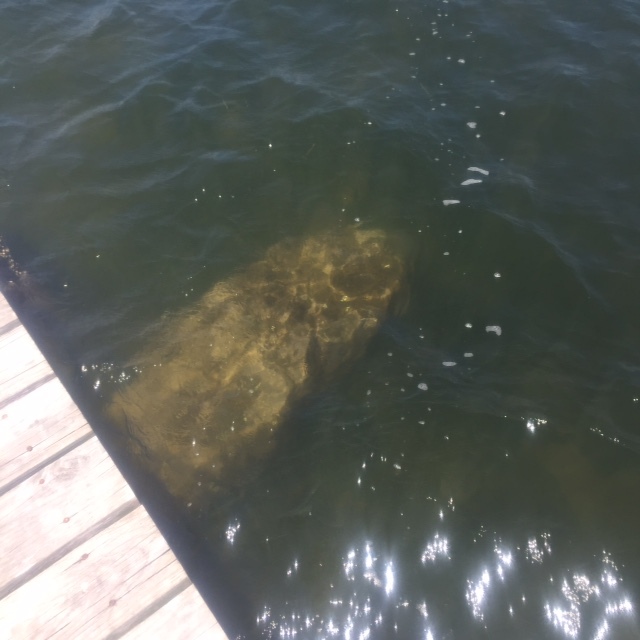 Manatees tend stay out of the deeper channels, so boats leaving the ICW for a favorite beach or their dock should keep an eye out. Most of the time they are just below the surface and only their nostrils break for a breath of air. They usually breathe every 3-5 minutes when swimming but can remain below for up to 20 minutes when they are resting. Approaching a manatee is still illegal. Though their status has changed from endangered to threatened, they are still protected by state and federal law. 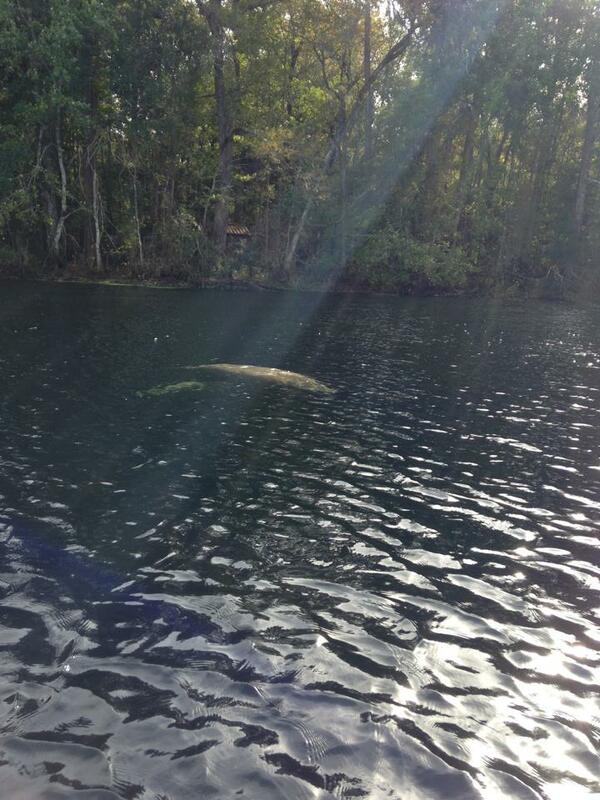 If a manatee is seen, keep your boat/PWC at least 50 feet from the animal. Please do not discard your hooks and monofilament into the water – again, numerous reasons why this is a bad practice. So Why are There More Encounters in the Florida Panhandle? Their original range included the entire northern Gulf coast. When their numbers declined in the 1960’s and 70’s there were fewer animals to venture this far north. Manatee sightings at that time did occur, but were very rare. Today, with increasing numbers, encounters are becoming more common. 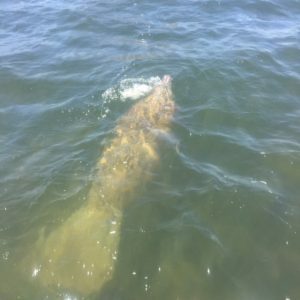 There is actually a Manatee Watch Program for the Mobile Bay area (https://manatee.disl.org/) and they have been seen as far west as Louisiana. They are truly neat animals and to see one in our area is a real treat. Remember to view and photo, but do not approach. I hope that many of you will get to meet what maybe new summer neighbors. Manatee swimming by a pier near Pensacola. 2017 Manatee Mortality Data. Florida Fish and Wildlife Conservation Commission. http://myfwc.com/media/4132460/preliminary.pdf. Florida Manatee Facts and Information. Florida Fish and Wildlife Conservation Commission. http://myfwc.com/education/wildlife/manatee/facts-and-information/. Manatee Information for Boaters and PWC. Florida Fish and Wildlife Conservation Commission. http://myfwc.com/education/wildlife/manatee/for-boaters/. West Indian Manatee. Wikipedia. https://en.wikipedia.org/wiki/West_Indian_manatee.